CampNavigator.com® an exclusive portal providing summer camps & summer programs information, operated by ADEPTELLIGENCE LLC. ADEPTELLIGENCE LLC welcomes you. 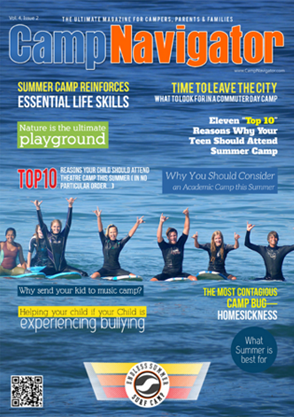 ADEPTELLIGENCE LLC's CampNavigator.com® & CAMPNAVIGATOR e-Magazine serves the Summer Camp Directors, Campers, Camp Vendors and Camp Job seeker community. ADEPTELLIGENCE LLC. provides users with access to a rich collection of resources, including without limitation various communications tools, forums, shopping services, search services, personalized content and branded programming through its network of properties which may be accessed through any various medium or device. You also understand and agree that the ADEPTELLIGENCE LLC Services may include advertisements and that these advertisements are necessary for ADEPTELLIGENCE LLC to provide the Services. You also understand and agree that these may include certain communications from ADEPTELLIGENCE LLC, such as service announcements, administrative messages and the ADEPTELLIGENCE LLC Newsletter, and that these communications are considered part of ADEPTELLIGENCE LLC membership and you will not be able to opt out of receiving them. Unless explicitly stated otherwise, any new features that augments or enhances the current Services, including the release of new ADEPTELLIGENCE LLC properties, shall be subject to the TOS. You understand and agree that the ADEPTELLIGENCE LLC Services is provided "AS-IS" and that ADEPTELLIGENCE LLC assumes no responsibility for the timeliness, deletion, mis-delivery or failure to store any user communications or personalization settings. ADEPTELLIGENCE LLC reserves the right to charge subscription and / or membership fees from a user, by giving reasonable prior notice, in respect of any product, service or any other aspect of this Site. Unless otherwise stated, copyright and all intellectual property rights in all material presented on the site (including but not limited to text, audio, video or graphical images), trademarks and logos appearing on this site are the property of ADEPTELLIGENCE LLC, its parent, affiliates and associates and are protected under applicable Indian laws. You agree not to use any framing techniques to enclose any trademark or logo or other proprietary information of ADEPTELLIGENCE LLC; or remove, conceal or obliterate any copyright or other proprietary notice or any credit-line or date-line on other mark or source identifier included on the Site / Service, including without limitation, the size, color, location or style of all proprietary marks. Any infringement shall be vigorously defended and pursued to the fullest extent permitted by law. You understand that all information, data, text, software, music, sound, photographs, graphics, video, messages, tags, or other materials ("Content"), whether publicly posted or privately transmitted, are the sole responsibility of the person from whom such Content originated. This means that you, and not ADEPTELLIGENCE LLC, are entirely responsible for all Content that you upload, post, email, transmit or otherwise make available via the ADEPTELLIGENCE LLC Services. ADEPTELLIGENCE LLC does not control the Content posted via the ADEPTELLIGENCE LLC Services and, as such, does not guarantee the accuracy, integrity or quality of such Content. You understand that by using the ADEPTELLIGENCE LLC Services, you may be exposed to Content that is offensive, indecent or objectionable. Under no circumstances will ADEPTELLIGENCE LLC be liable in any way for any Content, including, but not limited to, any errors or omissions in any Content, or any loss or damage of any kind incurred as a result of the use of any Content posted, emailed, transmitted or otherwise made available via the ADEPTELLIGENCE LLCServices. You acknowledge that ADEPTELLIGENCE LLC may or may not pre-screen Content, but that ADEPTELLIGENCE LLC and its designees shall have the right (but not the obligation) in their sole discretion to pre-screen, refuse, or remove any Content that is available via our portals and Services. Without limiting the foregoing, ADEPTELLIGENCE LLC and its designees shall have the right to remove any Content that violates the TOS or is otherwise objectionable. You agree that you must evaluate, and bear all risks associated with, the use of any Content, including any reliance on the accuracy, completeness, or usefulness of such Content. In this regard, you acknowledge that you may not rely on any Content created by ADEPTELLIGENCE LLC or submitted to ADEPTELLIGENCE LLC, including without limitation information in ADEPTELLIGENCE LLC Message Boards and in all other parts of the ADEPTELLIGENCE LLC Portals and Services. You acknowledge, consent and agree that ADEPTELLIGENCE LLC may access, preserve and disclose your account information and Content if required to do so by law or in a good faith belief that such access preservation or disclosure is reasonably necessary to: (i) comply with legal process; (ii) enforce the TOS; (iii) respond to claims that any Content violates the rights of third parties; (iv) respond to your requests for customer service; or (v) protect the rights, property or personal safety of ADEPTELLIGENCE LLC, its users and the public. You understand that the ADEPTELLIGENCE LLC Services and software embodied within the ADEPTELLIGENCE LLC Portals and Services may include security components that permit digital materials to be protected, and that use of these materials is subject to usage rules set ADEPTELLIGENCE LLC and/or content providers who provide content. You may not attempt to override or circumvent any of the usage rules embedded and any unauthorized reproduction, publication, further distribution or public exhibition of the materials provided on the ADEPTELLIGENCE LLC Portals and Services, in whole or in part, is strictly prohibited. Your correspondence or business dealings with, or participation in promotions of, advertisers found on or through the ADEPTELLIGENCE LLC Services, including payment and delivery of related goods or services, and any other terms, conditions, warranties or representations associated with such dealings, are solely between you and such advertiser. You agree that ADEPTELLIGENCE LLC shall not be responsible or liable for any loss or damage of any sort incurred as the result of any such dealings or as the result of the presence of such advertisers on the ADEPTELLIGENCE LLC Services. The ADEPTELLIGENCE LLC Services may provide, or third parties may provide, links to other World Wide Web sites or resources. You acknowledge and agree that ADEPTELLIGENCE LLC is not responsible for the availability of such external sites or resources, and does not endorse and is not responsible or liable for any Content, advertising, products or other materials on or available from such sites or resources. You further acknowledge and agree that ADEPTELLIGENCE LLC shall not be responsible or liable, directly or indirectly, for any damage or loss caused or alleged to be caused by or in connection with use of or reliance on any such Content, goods or services available on or through any such site or resource. ADEPTELLIGENCE LLC grants you permission to only access and make personal use of the Site and You agree not to, directly or indirectly download or modify / alter / change / amend / vary / transform / revise / translate / copy / publish / distribute or otherwise disseminate any content on ADEPTELLIGENCE LLC's Site / Service, or any portion of it; or delete or fail to display any promotional taglines included in the Site / Service either directly or indirectly, except with the express consent of ADEPTELLIGENCE LLC. However, you may print or download extracts from these pages for your personal / individual, non-commercial use only. You must not retain any copies of these pages saved to disk or to any other storage medium except for the purposes of using the same for subsequent viewing purposes or to print extracts for personal / individual use. ADEPTELLIGENCE LLC forbids you from any attempts to resell or put to commercial use any part of the Site; any collection and use of any product listings, descriptions, or prices; any derivative use of the Site or its contents; any downloading or copying of account information for the benefit of any other merchant; any renting, leasing, or otherwise transferring rights to the Site / Service; displaying the name, logo, trademark or other identifier of another person (except for indiatimes.com or you) in such a manner as to give the viewer the impression that such other person is a publisher or distributor of the Service on the Site, or any data gathering or extraction tools; or any use of meta tags. You may not (whether directly or through the use of any software program) create a database in electronic or structured manual form by regularly or systematically downloading and storing all or any part of the pages from this site. You agree to indemnify and hold ADEPTELLIGENCE LLC and its subsidiaries, affiliates, officers, agents, employees, partners and licensors harmless from any claim or demand, including reasonable attorneys' fees, made by any third party due to or arising out of Content you submit, post, transmit, modify or otherwise make available through the ADEPTELLIGENCE LLC Services, your use of the ADEPTELLIGENCE LLC Services, your connection to the ADEPTELLIGENCE LLC Services, your violation of the TOS, or your violation of any rights of another. YOU EXPRESSLY UNDERSTAND AND AGREE THAT: YOU'RE USE OF THE ADEPTELLIGENCE LLC SERVICES AND SOFTWARE IS AT YOUR SOLE RISK. THE ADEPTELLIGENCE LLC SERVICES AND SOFTWARE ARE PROVIDED ON AN "AS IS" AND "AS AVAILABLE" BASIS. ADEPTELLIGENCE LLC AND ITS SUBSIDIARIES, AFFILIATES, OFFICERS, EMPLOYEES, AGENTS, PARTNERS AND LICENSORS EXPRESSLY DISCLAIM ALL WARRANTIES OF ANY KIND, WHETHER EXPRESS OR IMPLIED, INCLUDING, BUT NOT LIMITED TO THE IMPLIED WARRANTIES OF TITLE, MERCHANTABILITY, FITNESS FOR A PARTICULAR PURPOSE AND NON-INFRINGEMENT. ADEPTELLIGENCE LLC AND ITS SUBSIDIARIES, AFFILIATES, OFFICERS, EMPLOYEES, AGENTS, PARTNERS AND LICENSORS MAKE NO WARRANTY THAT (i) THE ADEPTELLIGENCE LLC SERVICES OR SOFTWARE WILL MEET YOUR REQUIREMENTS; (ii) THE ADEPTELLIGENCE LLC SERVICES OR SOFTWARE WILL BE UNINTERRUPTED, TIMELY, SECURE OR ERROR-FREE; (iii) THE RESULTS THAT MAY BE OBTAINED FROM THE USE OF THE ADEPTELLIGENCE LLC SERVICES OR SOFTWARE WILL BE ACCURATE OR RELIABLE; (iv) THE QUALITY OF ANY PRODUCTS, SERVICES, INFORMATION OR OTHER MATERIAL PURCHASED OR OBTAINED BY YOU THROUGH THE ADEPTELLIGENCE LLC SERVICES OR SOFTWARE WILL MEET YOUR EXPECTATIONS; AND (v) ANY ERRORS IN THE SOFTWARE WILL BE CORRECTED. ANY MATERIAL DOWNLOADED OR OTHERWISE OBTAINED THROUGH THE USE OF THE ADEPTELLIGENCE LLC SERVICES OR SOFTWARE IS ACCESSED AT YOUR OWN DISCRETION AND RISK, AND YOU WILL BE SOLELY RESPONSIBLE FOR AND HEREBY WAIVE ANY AND ALL CLAIMS AND CAUSES OF ACTION WITH RESPECT TO ANY DAMAGE TO YOUR COMPUTER SYSTEM, INTERNET ACCESS, DOWNLOAD OR DISPLAY DEVICE, OR LOSS OF DATA THAT RESULTS FROM THE DOWNLOAD OF ANY SUCH MATERIAL. NO ADVICE OR INFORMATION, WHETHER ORAL OR WRITTEN, OBTAINED BY YOU FROM ADEPTELLIGENCE LLC OR THROUGH OR FROM THE ADEPTELLIGENCE LLC SERVICES OR SOFTWARE SHALL CREATE ANY WARRANTY NOT EXPRESSLY STATED IN THE TOS. A SMALL PERCENTAGE OF USERS MAY EXPERIENCE EPILEPTIC SEIZURES WHEN EXPOSED TO CERTAIN LIGHT PATTERNS OR BACKGROUNDS ON A COMPUTER SCREEN OR WHILE USING THE ADEPTELLIGENCE LLC SERVICE. CERTAIN CONDITIONS MAY INDUCE PREVIOUSLY UNDETECTED EPILEPTIC SYMPTOMS EVEN IN USERS WHO HAVE NO HISTORY OF PRIOR SEIZURES OR EPILEPSY. IF YOU, OR ANYONE IN YOUR FAMILY, HAVE AN EPILEPTIC CONDITION, CONSULT YOUR PHYSICIAN PRIOR TO USING THE ADEPTELLIGENCE LLC SERVICE. IMMEDIATELY DISCONTINUE USE OF THE ADEPTELLIGENCE LLC SERVICES AND CONSULT YOUR PHYSICIAN IF YOU EXPERIENCE ANY OF THE FOLLOWING SYMPTOMS WHILE USING THE ADEPTELLIGENCE LLC SERVICE: DIZZINESS, ALTERED VISION, EYE OR MUSCLE TWITCHES, LOSS OF AWARENESS, DISORIENTATION, ANY INVOLUNTARY MOVEMENT, OR CONVULSIONS. The ADEPTELLIGENCE LLC Services is provided for informational purposes only, and no Content included in the ADEPTELLIGENCE LLC Portals and Services is intended for trading or investing purposes. ADEPTELLIGENCE LLC and its advertisers shall not be responsible or liable for the accuracy, usefulness or availability of any information transmitted or made available via ADEPTELLIGENCE LLC Portals, and shall not be responsible or liable for any trading or investment decisions based on such information. None of the provisions of the User Agreement shall be deemed to constitute a partnership or agency between you and ADEPTELLIGENCE LLC and you shall have no authority to bind ADEPTELLIGENCE LLC in any manner, whatsoever. ADEPTELLIGENCE LLC shall have no liability to you for any interruption or delay, to access the Site irrespective of the cause. You and ADEPTELLIGENCE LLC agree that any cause of action arising out of or related to the ADEPTELLIGENCE LLC's web sites, only, must commence within one (1) year after the cause of action accrues otherwise, such cause of action will be permanently barred. By using ADEPTELLIGENCE LLC's sites and services, you signify your acceptance of this Privacy Statement. If you do not agree or are not comfortable with any policy described in this Privacy statement, your only remedy is to discontinue use of ADEPTELLIGENCE LLC sites. We reserve the right, to modify this Privacy Statement at any time.